Feeling unsure of your self? Despite what you see, I have confidence in me. It’s nothingthe Mother Superior, an old carpet bag and a new adventure can’t fix. Somewhere along the way I started to tell myself some lies about who I am. It’s so easy to do really, sometimes all it takes is one crappy experience as a kid or a particular placement in your family, a situation you find yourself in, just one little thing that you allow to sneak into your heart. Once you start to believe and invest in these untruths, they become bigger and hard to shake. We often struggle, endure, grieve, create space, make peace and embrace whole parts of ourselves that were never true in the first place. trust in your heart, trust your intuitions, put your doubts in a box and send them down the river. You are awesome! What a lucky soul who will enter into your family as child number 4. Continue spreading your inspiration and kindness, it does make a difference. just what I needed to read today to arrest the downward spiral of self-doubt and turn off the barrage of irrational thoughts. it’s a daily effort to stay on the right path, but at least now I know how to get there. stfu! i just sang that ENTIRE song yesterday at WORK. complete with the skirt swirl. and my tone-deaf, glorious voice. and then a coworker had the nerve to actually admit that she had never even seen it! 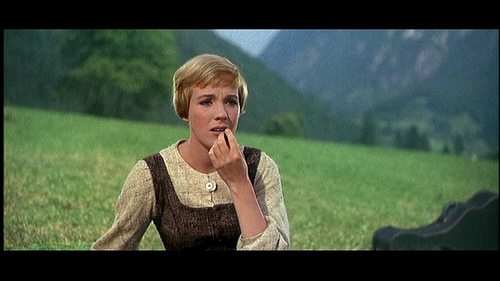 i am fairly certain we are the only two people in the universe that watched sound of music every day for a decade. Wow, this was an awesome post! I know most of it was tongue in cheek (my favorite kinda post, truth be told) but I did find this strangely inspiring. Maybe it’s time for me to rent The Sound of Music. I CAN climb every mountain, dammit! Oh, my god…I knew I loved you! The sound of music is one of my top 3 faves.!!! Three summers ago, Izzie and I watched it like at least 25 times! Can’t convince any of the other family members of its greatness!